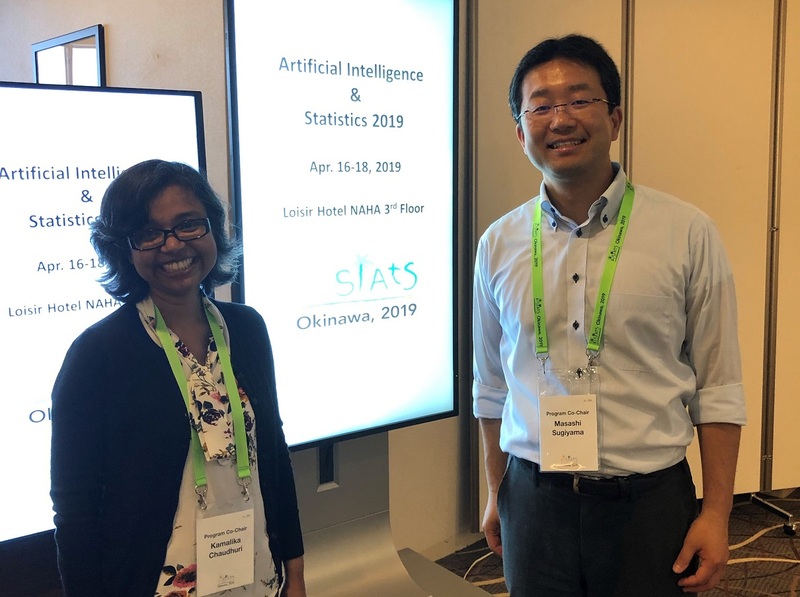 The 22nd International Conference on Artificial Intelligence and Statistics (AISTATS 2019) is held at Okinawa, Japan from April 16 to 18. This conference is sponsored by RIKEN AIP. Director Masashi Sugiyama is a Program Co-Chair(Photo left: Program Co-Chair, Associate Professor Kamalika Chaudhuri of UCSD), Team Leader Ichiro Takeuchi is the Local Chair, Unit Leader Makoto Yamada is a Workflow Co-Chair, and Team Leader Akiko Takeda is a Publication Co-Chair. AISTATS is a major international conference on artificial intelligence and statistics started in 1985 and it is being held in Asia for the first time in 2019. There will be 31 lectures and 360 poster presentations at the 3-day conference.